Dating back to its early days Ford has offered some of the longest lasting and hardest working vehicles available. Beginning with Henry Ford’s first race car – the Ford Sweepstakes – Henry Ford gave birth to this automotive brand’s full line of performance vehicles. Beginning with innovations such as mechanical fuel injection and insulated spark plugs that helped the founder of the Ford Motor Company win the one and only race in which he ever competed. Using the notoriety - and winnings - of that win Ford not only started this successful company, but his passion and ingenuity eventually powered this company’s way to wins at Le Mans, Daytona, Indianapolis and even Baja. Now, over 100 years later the successful company that was started by a man who had a dream to see the start of his Ford performance vehicle line become better every year would be blown away by the entire Ford Performance vehicles lineup. 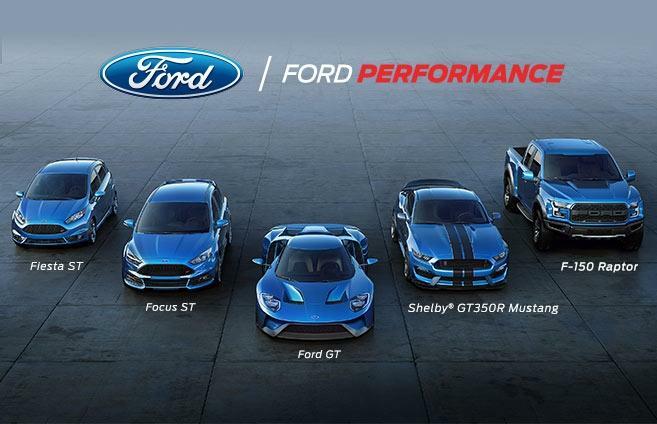 Although each new Ford model offers the best performance possible, there are few like its top-performing models – the Ford F-150 Raptor, Fiesta ST, Focus RS, Mustang GT, Mustang GT350R, Ford GT race car prove that Ford dealers across Southern California will now offer innovation through high performance. Along with the most popular Ford muscle car, the Ford Mustang GT or Ford Mustang GT350R, Ford now offers the coolest ultra-high-performance of sports cars – the all-new Ford GT. This super light, yet strong two-door coupé Supercar generates more than 600 HP and is the very definition of road of race ready aerodynamics. For those who are not really in the market for a low-cost Lamborghini of sorts, but would like a daily driver that offers more excitement than most should check out either the new Ford Focus RS or Fiesta ST. While both these rides may offer the appearance of your average hatchback sedan, getting behind the wheel of either Ford model will make you realize why vehicles like this are so popular on European race tracks. Anyone who is familiar with the popularity of the Ford F-150, is aware that this Ford truck is one of the hardest working on the market today. While most of this work is often centered around the construction industry or ranch work, the engineers at Ford Motor Company went a step further with the powerful new Ford F-150 Raptor. Unlike any production pickup on the road. Ford fit the regular F-150 with advanced off-road equipment, a 450 HP twin-turbo V6 engine and a paddle-shifted 10-speed automatic transmission that rocket’s this truck to 60 mph in 5.1 seconds. Like most Ford trucks, this F-150 model can also take on any terrain with ease, which is why this truck recently tackled the Baja 1000. The best reason to check out any of these Ford performance vehicles is knowing that you will be able to enjoy your vehicle choice at the Ford Performance Racing School. Much like the drivers featured, you will be able to test drive your Ford sports vehicle with personalized instruction from veteran racers at a world-class facility that includes multiple challenging road course configurations as well as desert terrain. Before heading to the track, get to your Southern California Ford Dealers today to slide behind the wheel of a high-performance Ford model today.